Do your cabinets look old and need a facelift? The experts at Nelson & Sons Painting will make your kitchen cabinets look new and beautiful. Find out more about our kitchen cabinet painting. Make your home beautiful! From New Berlin to Milwaukee to Oconomowoc, we are the painting experts to call on. 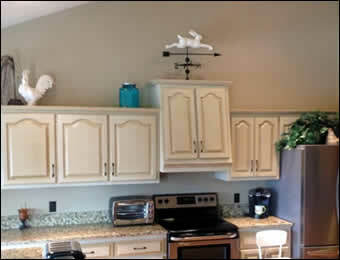 Find out more about Cabinet Painting. Freshen up your home instantly by having your home's interior painted by our expert painters. 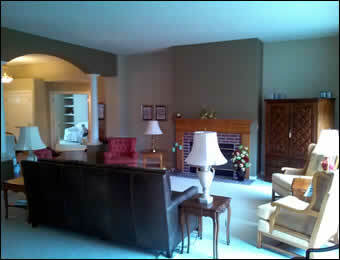 Our interior home painters can work with you to create the look you want. Painting Waukesha and Milwaukee County since 1987, Nelson & Sons Painting and Decorating is the professional painter offering solutions for your home and small business. Whether you are needing interior painting, exterior painting, cabinet's painted, faux finishing, historic restoration, wood staining, deck staining or any other surface treatment projects, we will always be professional and provide excellent customer service along with our expert painting skills. We are a full service painting company focusing on great results and delivering residential and small commercial painting projects that you will be satisfied with. We also offer drywall repair, plaster repairs and other minor repairs on surfaces we will be painting. Mike Nelson, the owner of Nelson & Sons Painting has many decades experience in painting and decorating and works closely with all clients to ensure all painting projects are completed on time and with only the best results. When you hire Nelson & Sons Painting, you an excellent painter along with a customer centered focus by our company who strive to exceed your expectations. Whether you are a homeowner or interior decorator looking for a professional painter, we are the best choice to service all of your painting needs. Nelson & Sons Painting is dedicated to serving the homeowners and businesses of New Berlin, Waukesha, Milwaukee, Brookfield, Elm Grove, Greenfield, West Allis, Muskego and the surrounding areas. We offer Free Estimates and Prompt Service. Contact Nelson & Sons Painting and get your painting project started today! © Copyright Nelson & Sons Painting and Decorating. All Rights Reserved. Website by Badgerland Marketing.